The Riigikogu concluded the second reading of two Bills. The Bill on Amendments to the Customs Act (22 SE), initiated by the Government, will simplify declaration of goods of a non-commercial nature for natural persons. Natural persons will be allowed to always declare goods of a non-commercial nature that are for personal use with a simplified declaration regardless of the value or weight of the goods. The Bill provides for giving the customs the right to verify whether goods are counterfeit. The Bill specifies the procedure for establishing an infringement of intellectual property rights in the customs. The granting of permission for the use and the procedure for revocation of TIR-carnets will be provided at the level of an Act. TIR (Transport International par Route) carnet is a customs document that facilitates customs procedures upon the crossing of state borders. The Bill will give the deciding on the issues of the uniform and insignia of customs officials to the competence of the Minister of Finance and the Director General of the Tax and Customs Board. The Bill on Amendments to the Aviation Act and the Act on Amendments to the Aviation Act and the State Fees Act (83 SE), initiated by the Government, establishes the general rule that aviation radio communication is ensured both in Estonian and in English, but only English is used when flying at the height of over 9.5 km in Tallinn flight information region. Radio communication in Estonian concerns circa 20 private pilots who do not fly so high. The requirement of radio communication in English arising from European Union law applies to commercial flights. The Bill also specifies the regulation concerning exemption from security checks. The Ministry of Foreign Affairs will be given the right to exempt guests who are on a visit on the invitation of the President of the Republic from security check on the request of the Director of the Office of the President of the Republic, and to exempt guests who are on an official visit to Estonia from security check on the request of a member of the Government of the Republic or the Secretary of State. The Bill on Amendments to the Water Act (82 SE), initiated by the Government, will update the requirements for the restriction of water pollution originating from agriculture. The Bill will restrict the period of spreading fertilizers in the autumn. If at present the spreading of fertilizers is prohibited starting from 1 December as a general rule, then in the future the spreading of mineral nitrogen fertilizers and liquid manure will be prohibited starting from 15 October. The amendment will enter into force in 2023 in order that farmers can adjust to the new requirement. At the same time, in the spring period, it will be allowed to start fertilizing ten days earlier, from 21 March. Also, stricter requirements will be established for the storage of manure by small animal keepers. The Bill on Amendments to the Citizen of the European Union Act and Amendments to Other Associated Acts (57 SE), initiated by the Government, will bring the Act into conformity with the requirements of the relevant EU directive on the right of citizens of the Union and their family members to move and reside freely within the territory of the Member States. The conditions for the imposition of punishments for taking aliens illegally across the border and for the facilitation of illegal stay in Estonia are also specified. The Bill on Amendments to the Act on Granting International Protection to Aliens and Other Associated Acts (81 SE), initiated by the Government, will harmonise the procedures in Member States for international protection, and establish European Union minimum rules for the procedures for granting and withdrawing international protection. It will also ensure higher standards for the procedures for international protection and increase the guarantees granted to applicants for international protection. The Bill provides for the possibility that the Government may, for humanitarian considerations or for fulfilment of an international obligation, decide to receive an application for international protection outside of Estonia. 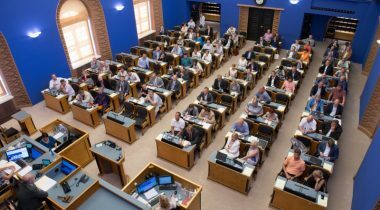 The Riigikogu did not pass the Draft Resolution of the Riigikogu “Making a Proposal to the Government of the Republic” (47 OE), initiated by the Estonian Centre Party Faction. It was intended to make a proposal to the Government to exempt from the social tax the remuneration that employers pay to 13‒18 year old young people who work in the pupils’ summer brigades. The result of voting: 30 in favour, no-one was against and there were no abstentions. At least 51 votes in favour were needed for the Resolution to be passed.